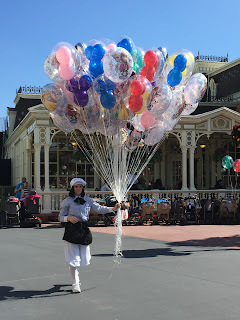 As I was walking through Town Square this morning, I spotted this balloon vendor who just came onto the street from backstage. She was carrying a full load, which appeared to be around 40 or 50 balloons. At that moment, I couldn't help but think of the movie, Up, and wonder why she wasn't floating away. Then, my brain shifted into math mode and I realized she probably had about $600 worth of balloons in her hand. Finally, I just took the picture and moved on.